Another year is finished, and we look back at all of the things that happened, good and bad. Access Press wishes the best for its readers in 2018. The 2017 Minnesota Legislature gaveled into session January 3, launching one of the most potentially complex and contentious sessions in recent years. Republican House and Senate leaders and DFLer Gov. Mark Dayton had to agree on a two-year budget for the state, or face a crippling government shutdown like one in 2011. Everyone had to concur on what to do with a $1.4 billion budget surplus. Minnesotans with disabilities and allies urged state lawmakers to consider spending on programs including Medical Assistance spend-down reform and wage increases to address the growing caregiver shortage. Calls were made for physical improvements at state hospitals and schools for children and youth with disabilities. Controversial attorney Paul Hansmeier was being investigated by the FBI for past work representing a nonprofit suing businesses for violations of the Americans with Disabilities Act (ADA). Hansmeier, who had been recently indicted for offenses related to copyright trolling, is now accused by a former client of withholding legal proceeds for the disability lawsuits. Before his law license was suspended, Hansmeier represented the Disability Support Alliance. Hansmeier would sue businesses for minor violations of the ADA, using “testers” who would look for violations. High fees are keeping too many Minnesota families out of the Medical Assistance/ Tax Equity and Fiscal Responsibility Act (TEFRA) program. Families in the program make sacrifices to pay fees meant to keep children with disabilities healthy and living in the community. More than 50 parents and children gathered in Roseville to share stories and mobilize for the 2017 legislative session. The Arc Minnesota is leading the charge, calling for state lawmakers to support a reduction in fees. The goal is to have the fees halved this year and eventually eliminated. Parent after parent, some in tears, described extremely difficult situations. Minnesota’s home care crisis played out at the capitol. More pay and benefits for home care workers are at the forefront for several groups. Advocates got mixed news after Dayton released his budget. Supporters for increased pay are working against a backdrop of thousands of job vacancies in the home care ranks. It was estimated that there were more than 8,700 job vacancies statewide. Workers who do home care for Minnesotans with disabilities earn less than many other works. Home care workers earn an average of $12.32 per hour, pay directly tied to state reimbursement rates set by lawmakers. “We deserve to have our voices heard, and our issues addressed.” Those words, spoken by Apple Valley parent Kelly Kausel, summed up sentiments of 2017 Disability Matters Day at the Capitol. Attendees cheered and chanted, to convey a message that a variety of supports are needed for people to lead independent lives in the community. The rally drew self-advocates from around the state, family members and allies. They called for the 2017 Minnesota Legislature to support policies that promote inclusion, choice, and independence for people with disabilities and their families. The Arc Minnesota, Minnesota Brain Injury Alliance, Get Up Stand Up to Cure Paralysis Foundation and Minnesota Consortium for Citizens with Disabilities organized the rally and lobbying day. Also at the capitol, a push for more self-direction through the Consumer-Directed Community Supports (CDCS) program met a positive response from legislative committees. Many groups led the charge the charge for more people with disabilities to benefit CDCS. The legislation, if passed, would expand budgets for people with disabilities who want individualized employment and housing. It would increase community options for people who are currently living in institutions. It would also update the methods used to determine service budgets. Severe Weather Awareness Week was marked April 17-21, but Minnesotans had already seen tornadoes and severe thunderstorms. It’s crucial for people with disabilities to be prepared well before thunderstorms roll in or a tornado siren sounds. Pay attention to the weather and know what terms mean. A severe thunderstorm or tornado “watch” means that conditions are favorable for the development of severe weather. Watches are typically issued up to six hours before a severe storm could hit. Access Press published spring and summer weather awareness advice in 2017, which can be found by searching the online archives. Renovation of Minnesota’s capitol was wrapping up. The verdict on accessibility by members of the disability community is primarily positive, with a few things that could be improved. A state staff team toured the restored capitol with Minnesota State Council on Disability (MSCOD). The capitol exceeds ADA requirements, but MSCOD has requested additional changes. Those were sent for review by project architects, contractors, tenants including the House and Senate, facility managers, project managers and others. Changes already made include everything from power door openers to low-pile rugs that are easier for wheelchairs to travel on. Parking and property clearance on hearing room tables were also addressed. How do Minnesotans feel about their neighbors with developmental disabilities? Some attitudes have changed for the better over the past 50 years. Other beliefs are cause for alarm and show that there is much progress to be made in understanding disability. Those are among key conclusions drawn from a survey released by the Minnesota Governor’s Council on Developmental Disabilities (MNCDD) and The Arc Minnesota. Surveys were also done in 2007, 2012 and 1962. Colleen Wieck, executive director of the governor’s council, said that repeating the 1962 study would gauge public opinion and attitudes. The original survey was conducted face to face with 900 Minnesotans. The 2017 survey gathered opinions from 1,001 Minnesota respondents. While attitudes changed dramatically between 1962 and 2007, some attitudes have remained unchanged over the past decade. Gillette Children’s Specialty Healthcare celebrated 120 years’ service to the community. Supporters gathered at the capitol April 25 to mark the occasion. On April 23, 1897, the Minnesota Legislature established Gillette as the nation’s first hospital specializing in care for children with complex medical conditions. The hospital was established at a time when these young patients were often marginalized by the health care system and the greater community. Dr. Arthur Gillette was hospital founder. Two champions of Minnesotans with disabilities were honored at the end of the 2017 legislative session. 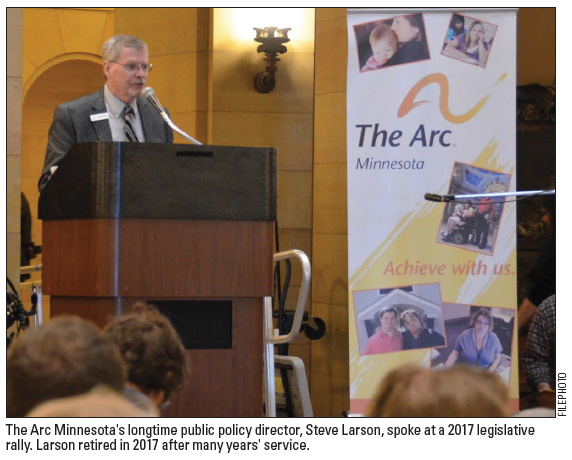 The Arc Minnesota’s Steve Larson retired as senior policy director. Anne Henry, a mainstay at the Minnesota Disability Law Center, retired in late 2017 but will still work on complex care issues. They received lifetime achievement awards from the Minnesota Consortium for Citizens with Disabilities. Session’s end meant mixed results for the community, as legislators had to go into special session to get work done. The first budget bills quickly fell to Dayton’s veto pen. One of the last bills that left the floor was health and human services, which is always carefully watched. The bill included some disability funding increases and long-term policy reforms. One huge disappointment was that human services spending was reduced by $463 million. Advocates had hoped for more compensation for caregivers than was awarded. A number of programs in the areas of mental health, special education, housing and developmental disabilities did get needed funding increases. One big win was in Consumer-Directed Community Supports (CDCS), where budget methodology and exceptions process were changed. This is seen as making CDCS and self-direction work more efficiently for children and adults with disabilities. Significant investments in Minnesota Security Hospital improvements and a pay raise for personal care attendants are taking shape. Hospital improvements were included in the bonding bill and in other human services legislation. Physical changes to make the facility safer, along with more staff, have been a priority. In 2014 a patient was fatally beaten and stomped upon by a fellow patient. Approved was $70.255 million to renovate the hospital and create safer working conditions for employees. An additional $22.85 million was also passed to increase safety by adding 146 employees. The new personnel will put Minnesota Security Hospital staffing levels closer to those at similar treatment facilities in other states. All eyes were on Washington, D.C. as debate continued over repealing the Affordable Care Act and making dramatic cuts and caps to the Medicaid program. Minnesota disability organizations and individuals were among the voices from around the country fighting to save the needed funding and health care coverage. It’s estimated that nationally, more than 10 million people would be affected. Lives are on the line, especially the ability to live and work in the community. People with disabilities make up 15 percent of Medicaid recipients but rely on 42 percent of the funding. A statewide mental health crisis hotline was able to stay open thanks to a last-minute assist from the Minnesota Department of Health. But the long-term future of the Crisis Connection remains uncertain. The line, which failed to receive support from the 2017 Minnesota Legislature, was to shut down July 11. Canvas Health of Oakdale, which operates Crisis Connection, said the site lacked financing to continue. Crisis Connection is a widely used, statewide mental health crisis line. Each county in Minnesota has a 24-hour crisis hot line, which provides counseling and access to crisis teams of mental health professionals. But finding resources isn’t always easy, especially for people in crisis. The possibility of its closure alarmed many mental health advocates. Many Minnesotans with disabilities and their allies have been involved in the fight to save the Affordable Care Act and Medicaid. Hundred marched and rallied at the capitol in St. Paul July 26 for the annual Americans with Disabilities Act celebration. Many of the chants and cheers focused on preserving health care, as well as the services and supports needed to be part of the greater community. Participants and rally speakers said that preserving health care and Medicaid are basic civil rights. Access to needed medical equipment and supplies continues to cause problems for many people with disabilities. The latest fight in Minnesota is to repeal a law which affects incontinence supplies. The law takes effect July 1, 2018. The Midwest Association of Medical Equipment Suppliers (MAMES), its members and other advocates want to overturn a law requiring Minnesota to bid out incontinence products. The law was tucked into the 2017 health and human service omnibus bill in the final hours of the legislative session. Bill Amberg, who is MAMES’ lobbyist, said member medical supply dealers are frustrated that the bill addition came without debate or discussing. MAMES and its allies are working to overturn the bid requirement before it takes effect. The change could be yet another blow to Minnesota’s medical supply and durable medical equipment providers. More than half a dozen companies have closed during the past year, including longtime Twin Cities firm Key Medical Supply. When Stuart Holland stepped down as manager of Minnesota Radio Talking Book Network in September, he didn’t call it a retirement, but a transition. He was a state employee since 1975, and with Radio Talking Book since 1986. The audio book service went through many changes during his tenure. After complaints about homeless people sleeping in skyways and bad behavior, the St. Paul City Council voted to reduce downtown skyway hours. Downtown St. Paul’s skyways can opt to close at midnight instead of 2 a.m., as of mid-month. That’s too early for many downtown residents and workers, including the elderly and people with disabilities. The time change is part of the revised skyway code of conduct ordinance. Many of the elderly and people with disabilities worried about getting safely home from work or leisure activities. Minnesota’s This is Medicaid coalition was making itself heard to protect the future of Medicaid, holding education events and appearing with Dayton at a press briefing. Medicaid, known as Medical Assistance in Minnesota, supports a wide range of services. Minnesota’s This is Medicaid coalition includes more than 150 groups. About one million Minnesotans rely on Medicaid for services and supports. Dayton harshly criticized federal efforts to cut Medicaid, calling such actions “a tragedy” and “a travesty.” He described the proposed cuts as an “abandonment of people who need government support by people who don’t.” Dayton is also unhappy that under one proposal, states would have to make the decisions on which programs to keep and which to cut. Paralympian and motivational speaker Mark Braun was honored as the 2017 Access Press Charlie Smith Award winner. A large crowd gathered at the newspaper’s annual banquet to recognize him and to celebrate disability community accomplishments. Fears were expressed for the future of the Americans with Disabilities Act (ADA). Groups including the Minnesota Council on Disability, the American Civil Liberties Union and Disability Rights Education & Defense Fund (DREDF) are alarmed about the ADA Education and Reform Act of 2017. Disability rights advocates contend that the legislation isn’t reform, and would roll back rights and inclusion. Title III of the ADA allows people with disabilities to file lawsuits against business owners who don’t provide reasonable accommodations. Businesses found to be in violation don’t pay monetary damages, only attorney’s fees. Business must provide injunctive relief, to correct the violation. Businesses are only required to provide accommodations when doing so doesn’t present an undue burden, and when changes are technically feasible and affordable. Federally funded resources have long been in place to help businesses comply. The legislation would weaken consequences and remove incentives outlined under Title III. It also wouldn’t eliminate frivolous lawsuits by attorney’s seeking damages rather than access improvements. Autism spectrum disorders and sleep apnea have been added to the list of qualifying conditions for Minnesota’s medical cannabis program. The news was greeted with enthusiasm by some parents with children on the autism spectrum, who hope that medical marijuana can help their children. Some parents had used medical cannabis with success and others are eager to try it. Threats to Medicaid and the Affordable Care Act (ACA) are heightened, because of the sweeping Tax Cuts and Jobs Act bills passed by the U.S. House and Senate. Final floor votes took place before Christmas. The bills represent the largest tax overhaul in three decades and the impacts vow that Medicaid and Social Security will be their next targets. For people with disabilities, low-income people and many senior citizens, the bills are a disaster. Disability and elder groups around the nation weighed in on the very real threats to the supports that keep people healthy, employed and living in their home communities. Many expressed dismay at Congress’s actions, which are paving the way for cutting Medicaid, Medicare, Supplemental Security Income and other critical programs for people with disabilities in order to pay for the tax cuts later.